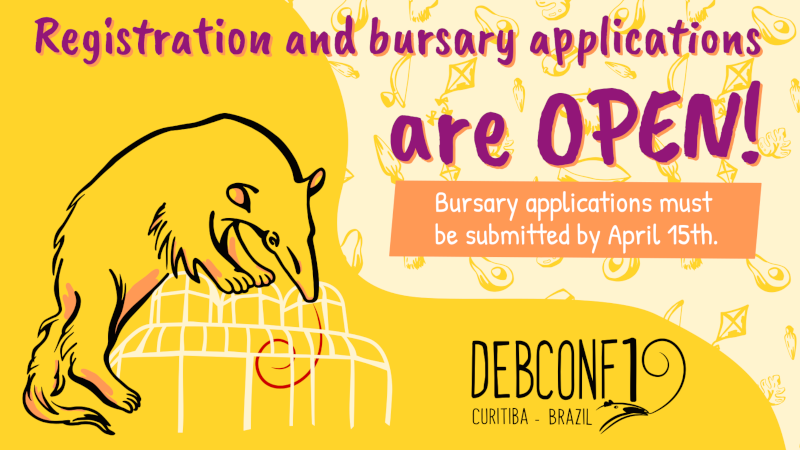 The DebConf Content team would like to call for proposals in the DebConf 19 conference, which will take place in Curitiba, Brazil, between July 21th and 28th. It will be preceded by DebCamp from July 14th to 19th, and Open Day on the 20th. You will need to create an account on the site, to submit a talk. We suggest that Debian account holders (including DDs and DMs) to use Debian SSO when creating an account. However, this isn't required, as you can sign up with an e-mail address and password. All proposals must be submitted before Sunday April 28th, 2019 to be evaluated for the official schedule. You are welcome to either suggest more tracks, or to become a coordinator for any of them. For more information, see the Content team wiki. This call for proposals also targets Open Day, a day of activities targeted at the general public on July 20th. Topics of interest range from topics specific to Debian to the greater Free Software community and maker movement. The idea of Open Day is to bring the general public closer to Debian and vice-versa, so activity proposals that go in that direction are more than welcome. If you are interested in presenting on Open Day, let us know in the "Notes" field of your submission. We might also invite proponents that are not specifically targeting Open Day to present in it if we find that the topic fits the above goals. The Open Day will host activities in multiple languages. We expect to have activities in English, Portuguese, and Spanish. If your talk will be in portuguese, you can write the Abstract field in portuguese too. This year we will be holding holding office hours on IRC. Those will be designated times where the DebConf content team will be available to help potential speakers prepare their talk proposals for DebConf. Dates and times for those will be announced later. DebConf 19 is still accepting sponsors; if you are interested, or think you know of others who would be willing to help, please get in touch with sponsors@debconf.org. We hope to see you in Curitiba!